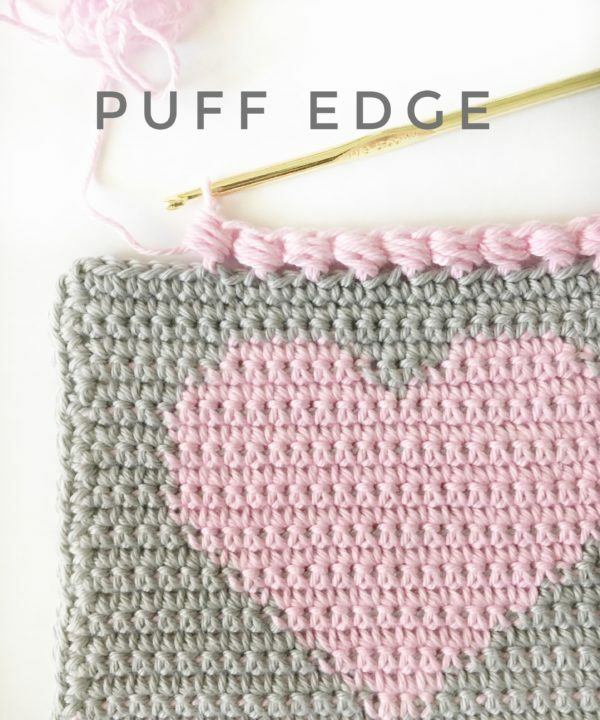 This sweet little crochet puff edge finishes off a heart project perfectly, don’t you think? Start this crochet puff edge by pulling up a loop and work an HDC (half double crochet) in that stitch. Skip a stitch, HDC, then, around the post of the HDC, HDC3TOG. Don’t know how? Here’s what you do: yarn over, (YO) pull up a loop, YO again, pull up a loop, YO again, pull up a loop, YO and pull through all loops on your hook. There should be seven. Still can’t quite imagine it? Check out this little video clip I made! To finish the round, do a puff edge stitch into the first stitch you started with then slip stitch to the top of that HDC and weave in the ends. And in the corners, I worked two or just the one, it really depended on how my stitches lined up. You’ll need to do a row of single crochet before you start your puff edge! Work 3 SC into each corner. If it works that you land in the center stitch, just do one puff, if not, do two! It’s a very forgiving stitch around the corners, so don’t stress too much. Love to you all! Thank you to all my wonderful followers on Pinterest, Facebook, YouTube, wherever you are, I’m so glad you’ve found your way to my farm. Come play along on Instagram and share your work. I’d love to see if you use the puff edge! tag your photo with #daisyfarmcrafts so I can check it out! It’s really a lot of fun!